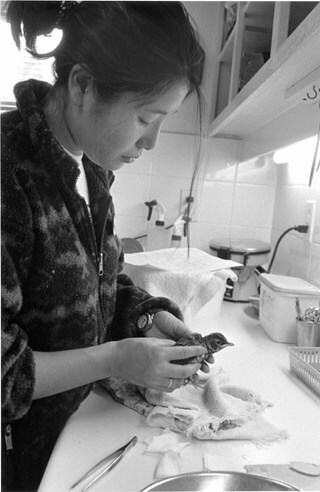 Photograph of Lisa Miyagi of Burnaby Wildlife Rescue cares for an America Robin. 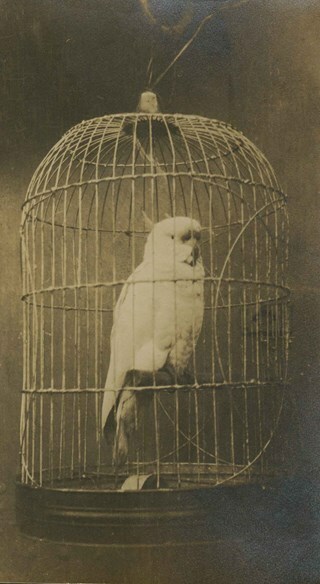 Note in black ink on recto of photograph reads: "60% Bby p. 14 / 1284 B Brian Bby"
Photograph of a bird inside a cage, onboard the H.M.S. New Zealand while it was in Vancouver Harbour. 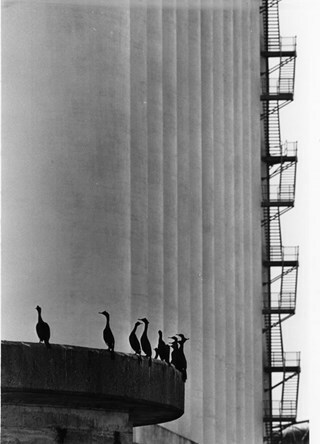 Photograph of cormorants near a Burrard Inlet industrial plant in Burnaby. 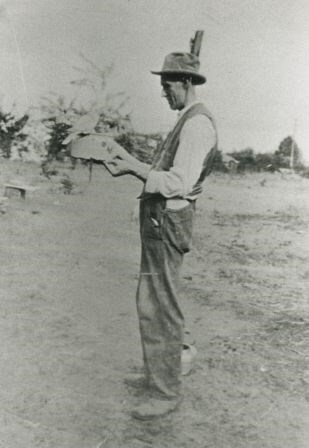 Note in black ink on recto of photograph reads: "605D Bby Mario"
Photograph of Raymond "Ray" Carman feeding pigeons in Stanley Park, Vancouver, British Columbia. Note written on album page reads: "Raymond Vancouver / May 1949"
Note in black ink on verso of photograph reads: "To Mum + Dad / Raymond / Vanc. B.C. / May, 1949"
Photograph of Leida Doria "Lillian Doris" (Carman) Yanko holding a bird in her hands while standing next to her mother Eugenia "Jenny" (Haresomovych) (Carman) Nagy at Stanley Park in Vancouver, British Columbia. 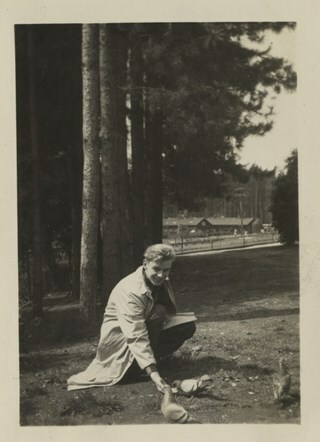 Note in black ink on verso of photograph reads: "Mum + I / Stanley Park, Vancouver, BC Oct. 23/10 "
Note written on album page reads: "Stanley Park / 23 October 1949" and "'Mom + I'"
Photograph of Graham Ford, director of Wildlife Rescue Association of British Columbia, tending to a Old Squaw after it was hurt trying to land on ice. 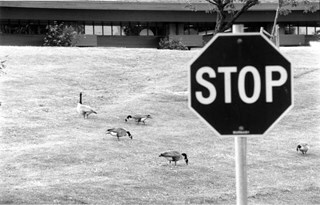 Note in black and blue ink on recto of photograph reads: "50% page 4 Bby / 104 Bby Mario"
Photograph of Canadian geese on the grass outside of the Burnaby Lake Sports Complex. Note in black ink on recto of photograph reads: "1142 Bby Brian / Bby - 2 49%"
Accompanying caption reads: "May 24, 1998 1142: / Geese feel at home at Burnaby Lake Sports Complex. Article entitled "Geese make a mess of city sports field."" Photograph of a hummingbird sitting in its nest on a tree limb. A caption written around the outside frame reads: "This is very good I think of the young humming bird in nest. I will enlarge when I have time. Ask Daddy if he would like a print of this 'His Bird.'" The caption was most likely written by Kitty Hill (later Kitty Peers). Photograph of Florence McMahon, daughter of Florence Bookey McMahon and James McMahon, wearing beach pyjamas, the fashion of the day. 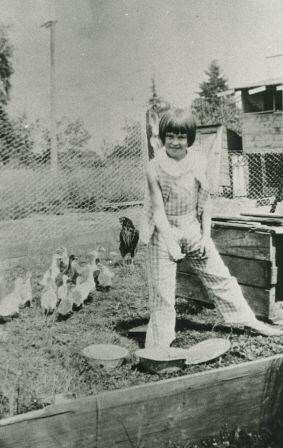 She is feeding pet ducks who were hatched by the hen in the background. She is on the McMahon property on Waltham Avenue, later numbered 6558 Waltham Avenue. 1 photograph : b&w postcard hand-tinted into col.
inscribed in the original negative, printed on recto, c. r. "The Birds' Paradise,/ Vancouver, B.C./ No. 2. ", l.l. "[copyright c with circle]" printed on verso, t. "MADE IN CANADA BY THE COWEN, SUTTON CO. LTD., VANCOUVER, B. C."
Photographic postcard of an unidentified man in tweed suit smoking a pipe.There are birds resting on his head, on his pipe and hand, on his shoulder and his forearm. The birds on his hand have been coloured red, and the others are coloured yellow. A caption to the photograph reads: The Birds' Paradise / Vancouver, B.C. / No. 2. Image from personal photograph album of Tom Irvine (Tommy Irvine). Photograph of a Pelican and a Canadian Goose at what appears to be Beacon Hill Park. Photograph of a Pelican and a Canadian Goose at what appears to be Beacon Hill Park. 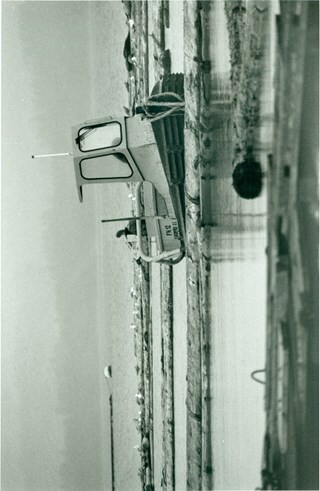 Photograph of a small tugboat in the Burrard Inlet with seagulls in the background. Note in black ink on recto of photograph reads: "Bby 36% pg 2 / 1995 - Bby - Rebecca"
Photograph of ducks swimming in a lake or a pond. Note the grassy edges around the water. The location is not identified. inscribed in blue ballpoint pen, recto, b. "JUNE 13 - 42." 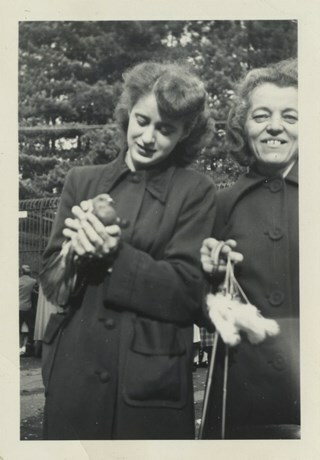 Photograph of sisters; Trudi and Aili Rintanen with pets in their arms. Trudi is holding their bantam rooster, and Aili is holding a cat. The Rintanen family lived on the Burrard Inlet squatters' site known as Crabtown. 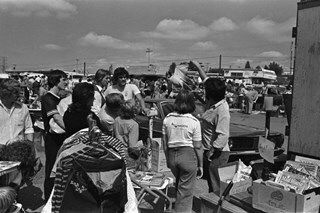 Photograph of a group of people gathered to watch an unidentified vendor and his parrot at the Lougheed Drive-in swap meet in the summer of 1978. 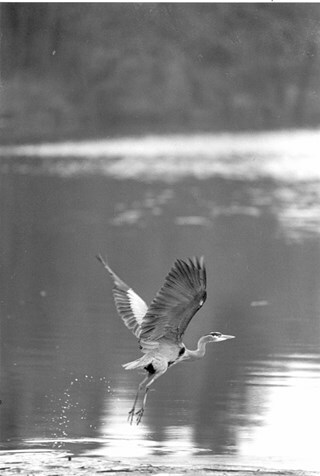 Photograph of a Great Blue Heron in Deer Lake Park. 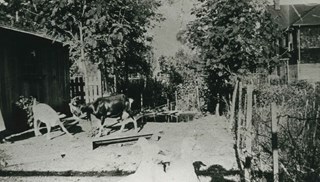 Note in black ink on recto of photograph reads: "03/05/95 BBY/NW 3"
Photograph of goats, Patsy and Corey, by the duck pond in the back yard of "Rowanlea," the Urquhart family home built by William Urquhart at Griffiths Avenue and Burford Street. The house was previously numbered 2674, then changed to 6625, and later 6637 Griffiths Avenue. 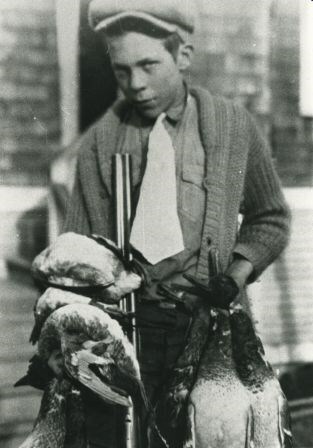 Photograph of George Donovan, duck hunter, with a Remington double barrel 12 gauge shotgun with hammers. He is holding a bag of mallards from the mud flats on north side of Burrard Inlet. Photograph of a small stone fountain spraying water in a pond laid with stones along the edges. There are swans and ducks in the pond, with trees and a part of a wooden building in the background. A note in the accession register speculates the location is Beaver Lake in Stanley Park. 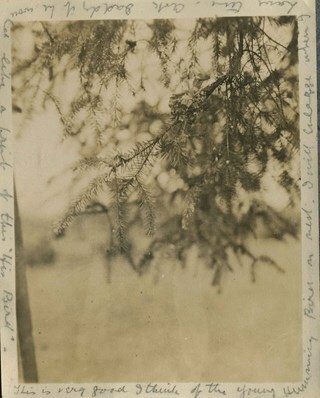 The name "velox" is lightly printed on the back of the photo paper: thus, the photograph is printed on Kodak velox photo paper made in early 1900s for amateur photography. 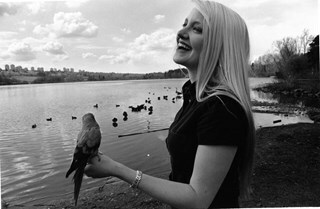 Photograph of Kyra Thody holding her pet parrot at Deer Lake. There are ducks and Canadian geese in the background of this photograph. 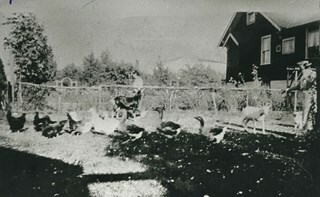 Note in black ink on recto of photograph reads: "754 Bby Rebecca / 75% p. 1"
Photograph of the Urquhart menagerie: dog, Fluff; goats Patsy (black) and Corey (white); goose, Mollie, and her goslings, Goosey and Gander; and, miscellaneous ducks and chickens. This photograph was taken at the Urquhart family home, "Rowanlea," located at Griffiths Avenue and Burford Street. The house was previously numbered 2674, then changed to 6625, and later 6637 Griffiths Avenue. Photograph of four women in dresses, overcoats, and hats standing around dead deer and bears on the ground in front of them. Three of them are holding rifles, and the fourth woman is holding a bird by its feet, upside down. The setting is in the woods. Accompanying note prepared by Burnaby Village Museum reads: "The Huntresses - c. 1910 / Deer, bear and game birds abounded in Burnaby forests until civilization scared them out. These animals could well have been bagged in Burnaby up until the 1920's but it is not likely that the young ladies in the picture had anything to do with the hunt except to provide the photographer with 'live' models."